uno dei migliori siti di immersione nel profondo sud. 40 kilometers north of Marsa Alam. This reef contains a huge number of dive sites and is especially suitable for beginners and night dives. Small shark and stone fish are often to be seen there. A collection of 7 reefs offering sheltered diving, suitable for check dives and night dives when you have a good chance of seeing a sleeping turtle and spanish dancers. Good chance of seeing white tip reef shark and many nice swim throughs and caves. 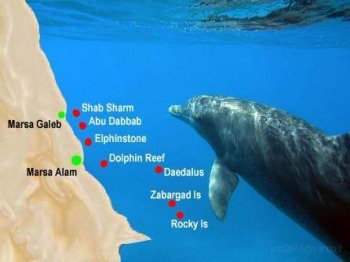 About 30km north of Marsa Alam and 12km offshore this reef comes up from a depth of 130m. The sheer walls of this great reef plunge steeply into the blue. This legendary reef is one of the most beautiful in the Red Sea. It is richly decorated with soft corals, black corals, sponges, gorgonians and fans. Sharks often swim over the plateaus at the North and south of the reef. The east and west walls make an excellent drift dive taking in the plateaus. Frequent sightings of Hammerheads and Oceanic White Tip sharks. A very good spot for pelagic fishes. The north has different beautiful plateaus at 2Om 35m and 40m. At the edge of the plateau if you look down in the deep blue it's possible to see hammerhead sharks watch your depth!! After the plateaus, drift on the east side of the reef and don't forget to look in the blue and up. Encounter with big pelagic including oceanic white tip shark (carcharhinus longimanus) is possible. This large horseshoe shaped reef is now the permanent home of a large pod of Spinner Dolphins thanks to its Marine Park status. There are several dives to do on this reef including its outer walls and the large group of pinnacles on its western tip. You will find caves, corals and an abundance of fish on this reef. One of the few places in the world where it's possible to dive with dolphins... and they are wild; free and not tamed or fed. A group of more than 100 dolphins is resident on this reef. Only on a very calm sea and by bad luck you will not be able to see them! Although a beautiful reef, Abu Galawa is most famous for its 1950's wreck of the tug boat Tienstin. Lying from 18m to 5m in depth, this wreck, it is overgrown with all kinds of coral and is smothered with glassfish. It's shallow depth makes it an ideal night dive. Very popular with all divers, this reef has multiple caves, grottos and passages. It is possible to take very impressive photographs here where the many shafts in the ceiling allow sunbeams through to illuminate the magical set. Excellent dives on both the north and south plateaus, with strong currents which favour the growth of all types of coral. Highly likely to see grey reef sharks and tuna. The south plateau has three pinnacles, overgrown with soft corals, they contain several caves and crevices where glassfish and groupers, amongst others, hide. The crescent of reef around the reef's southern tip offers the best diving, with rich coral growth from the surface shallows down, and the most int4eresting profile and layout in the area. There are numerous undercut sections and reef shelves harboring dense soft coral growth and a good range of hard corals. There are also some good black coral bushes on the wall's deeper sections. With its steep walls and remarkable large eastern plateau at about 30m you will find a lot of diversity on this reef. There is always the possibility to encounter Manta Rays, sharks and other big fish, as well as beautiful soft corals and schools of fish over the plateau.